Machchkund Hydro-electric power project and Duduma dam are located in the tribal hamlet of Onakadilli near Paderu - a tribal agency in the Visakhapatnam district of Andhra Pradesh. MachchKund Hydro-electric Power Project and Duduma Damchese are the two places that are under the Government of Odisha, just across the border of Andhra Pradesh. Araku, the beautiful hill resort in Visakha district is the nearest place to get to Machchkund power plant. 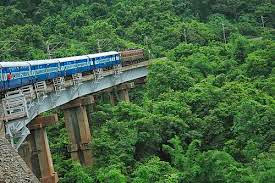 Tourists can either take the rail route to Araku Valley from Visakhapatnam or ride in a cab on the ghat roads. A road trip to Araku on either way is highly enjoyable but a train journey is even more enjoyable and thrilling as the train passes through 55+ tunnels. The beauty of nature with high mountains on one side and deep gorges on the other and the train puffing slowly on the tracks is something to be cherished in life. There is no accommodation near Machchkund Power plant. However there are good number of budget as well as luxury hotels in Araku and there are also resorts at this hill station. Tourists can also book accommodation at Haritha resorts operated by APTDC (Andhra Pradesh Tourism Development Corporation). However, tourists need to compromise with the food as local ethnic food is served in most of the hotels. From Araku, tourist can take a ride to Machchkund Power project. On reaching the dam, tourists can see a strange apparatus known as WINCH. Two trolleys are attached to this winch. Tourists / visitors sit / stand in this apparatus and move down to reach the power project. It reminds one of a cable car but unlike hanging down from the rope a winch runs on rails like a roller coaster. A winch is a roller or a powerful hoisting apparatus consisting of a trolley round which a cable is wound attached to the object to be lifted or moved. On reaching the spot, tourists need to buy tickets for rolling down in the winch (pronounced as 'bheench' by the local people as the letter 'V' is pronounced as 'bha' by the people of Odisha and West Bengal), to reach the power plant. The winch precariously inclines on the rails and some tourists may feel a bit nervous to roll down in the winch. After the visitors are seated, the rod will be locked and when the switch is on, visitors could hear the rolling sound as the winch slowly started rolling down. Some tourists get thrilled and start screaming and shouting. As the winch rolls down visitors can have a spectacular view of the valley with green mountains all around, waterfalls and the Machchkund river which looks simply awesome. The water from the river is diverted towards the turbines from the D-dam (Diversion dam). This is a unique and thrilling experience to roll down in a winch which reminds one of a roller coaster ride. The winch rolls down to a depth of 2110 ft in the valley to reach the power station. On reaching the power station, the tourists will be guided inside the power plant. At this point visitors can watch the river water that is diverted to the turbines. On getting inside the power plant, visitors can see six turbines rotating with high speed and making a loud sound. Here visitors will get to know about the generation of hydro-electric power i.e. electricity. It would be a great experience to practically see the power generation and it gives visitors good knowledge about electricity generation. The water, after generating power, passes out through the inundating gates. Moreover, visitors can understand how difficult it is to generate electrical energy from the running water. A visit to Machchkund Hydro-electric power project would a wonderful educative tour where visitors gain much knowledge. And I'm sure when people have a practical experience of the step-wise process of power generation, they will surely say 'NO' to power wastage. After completing the educational tour and gaining enough knowledge on power generation, visitors once again get into the winch and this time they roll up to the winch-house which is equally exciting and thrilling.